Bacterial meningitis is a serious condition that can kill within hours. In 2011 and 2012, there were around 2,350 cases of bacterial meningitis and blood poisoning (septicaemia) in the UK. Bacterial meningitis is a serious condition that can kill within hours. In 2011 and 2012, there were around 2,350 cases of bacterial meningitis and blood poisoning (septicaemia) in the UK. One in ten people with bacterial meningitis die, while 15% of those who survive are left with severe after-effects such as brain damage, hearing and sight loss, and, where septicaemia has occurred, loss of limbs and scarring. Meningococcal B (MenB) disease is the most common cause of bacterial meningitis in the UK and Ireland. 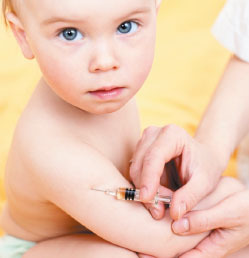 From September 1, a new vaccine for MenB is being offered to all babies born on or after May 1. The vaccine is given to babies aged two months, with a second dose at four months and a booster at 12 months. There will be a limited catch-up programme for babies who are due to have their three and four month vaccinations in September. Meanwhile, 17 and 18 year olds and university entrants aged 19 to 25 are to be offered one dose of a new vaccine, called MenACWY, which covers the aggressive meningococcal group W.
Meningitis is an inflammation of the lining around the brain and spinal cord. Septicaemia is blood poisoning caused by the same germs. The bacteria are spread through close contact. MenB affects children under five years of age most commonly, particularly babies under the age of one. For MenW, teenagers are most at risk. Symptoms include a high fever, cold hands and feet, and vomiting. The patient may feel agitated or become drowsy, floppy and unresponsive. They could grunt, breathe rapidly, have a stiffneck, dislike bright lights and have convulsions or seizures. Symptoms can also include pale, blotchy skin and a red rash that does not fade when a glass is rolled over it. A baby may refuse to feed, have a high-pitched cry and have a tense, bulging soft spot on their head. Symptoms can appear in any order, and some may not appear at all. Nurses must remain alert to the symptoms of meningitis and septicaemia, which should be treated as medical emergencies. If treated promptly, bacterial meningitis is less likely to become life threatening. Use of paracetamol has been advised for infants at the time of immunisation with the MenB vaccine, to prevent fever. ‘Meningococcal disease can kill within hours or leave survivors with lifelong disabilities such as hearing loss, epilepsy, limb loss and learning diffi culties. It is good news that infants and teenagers are to be given additional protection against this potentially devastating disease.